A level students at The Sixth Form College, Solihull packed out the lecture theatre last week for a presentation from acclaimed academic Dr Edith Hall. 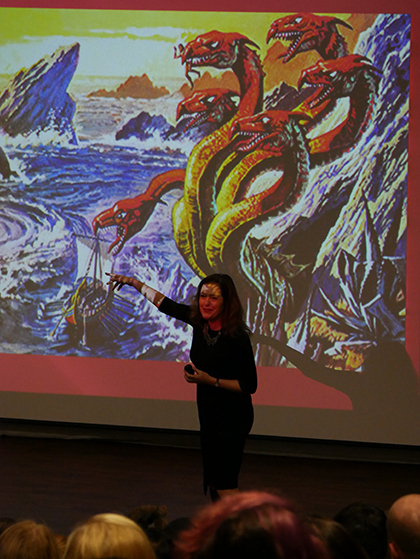 A renowned Classics Professor, writer and broadcaster, who works at University College London, Dr Hall delivered a lecture on Greek Mythology and the World of the Hero, with particular emphasis on the Odyssey. She also told students about her government-funded project ACE, which stands for Advocating Classics Education. This project is about promoting the study of Ancient History and Classical Civilisation in State schools. As well as visiting the College, she will be visiting Ninestiles School in November to talk to Year 11 students. The aim of the project is to offer subjects like this to a wider audience and to develop cultural breadth to all whatever their background. With this in mind, it was not just Humanities students who attended the lecture, but students from a variety of A level subjects. The College’s Humanities department consists of Ancient History, Philosophy, Religious Studies, History, Geography and Geology at A level. Students are encouraged to pre-register for Open Day on Saturday 13 October.